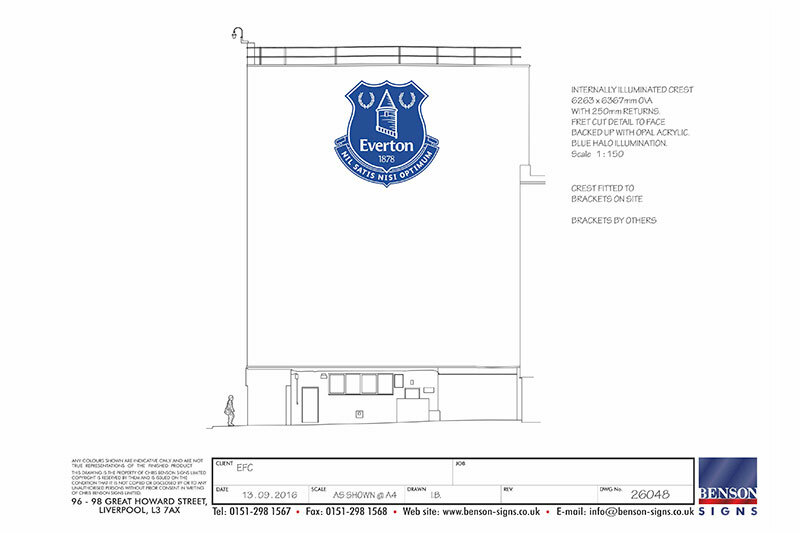 As part of a major facelift to Goodison Park, we gratefully accepted the challenge to manufacture 2 large 6.5m x 6.5m club crests for Everton FC, these were to be sited at high level at either side of the Park Stand. There were big challenges in constructing the crests, we looked at many simpler methods such as digitally printed flex face boxes, but it was decided that these could not give the true outer shape and 'badge look' that was important in the interpretation of the clubs crest. It was decided to make the crests in powder coated aluminium and the shape was broken up into modular sections for cutting and to make fabrication and handling easier, this was tricky because all of the white badge detail was required to illuminate and so the section splits would need to avoid this as much as possible. 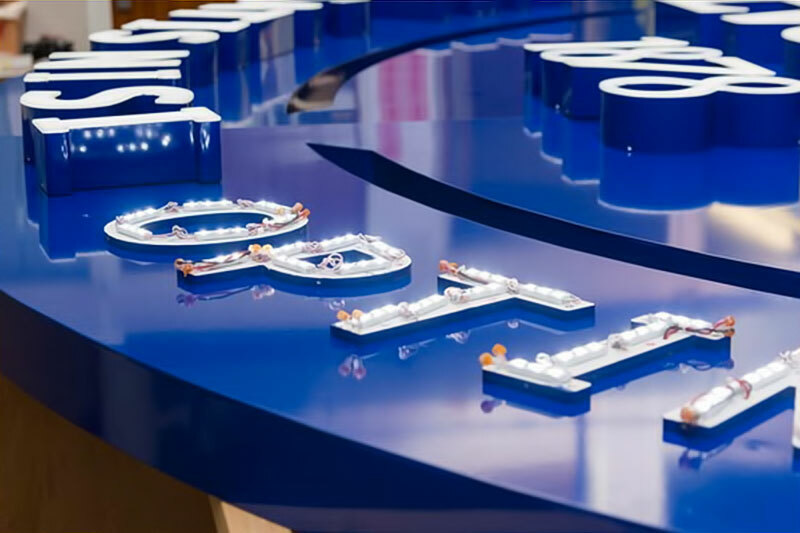 As well as the badge detail illuminating, there was a requirement for light to escape from the rear and for the crests to stand off the surface of the new blue cladding, this meant that the rear carrying structure for the aluminium sections to attach to was formed from thick clear polycarbonate to allow the light to escape. All the pieces of the carrying structure were internally re-inforced with heavy aluminium angle so that the back structure could be bolted to crossrails that were in turn bolted to steel bracket protrusions that were welded to the original stadium structural steelwork. 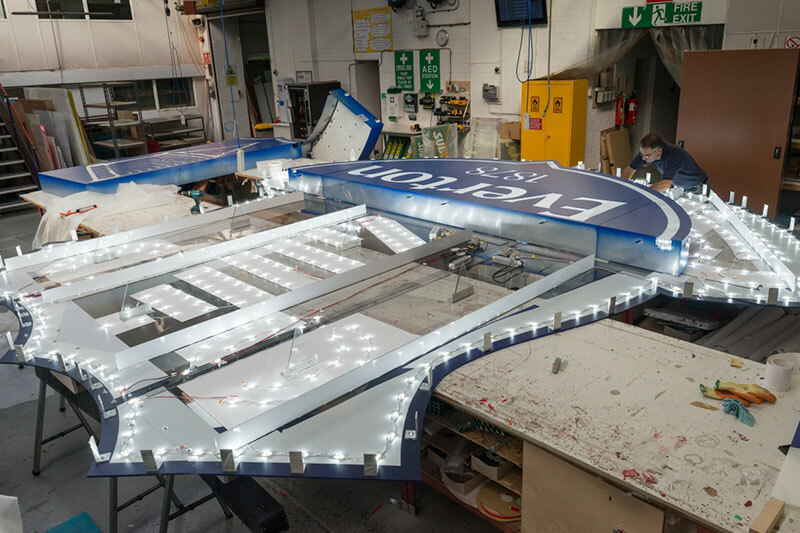 Approximately 1000 white low energy LEDS were fixed within each crest to the rear carrying structure to illuminate the white badge detail and allow some light to escape from the rear and wash onto the cladding behind. Each crest was fitted in position by a team of 2 installers using a specialist access machine with a lifting aid attached to handle the individual sections, each took approximately 4 days to install. 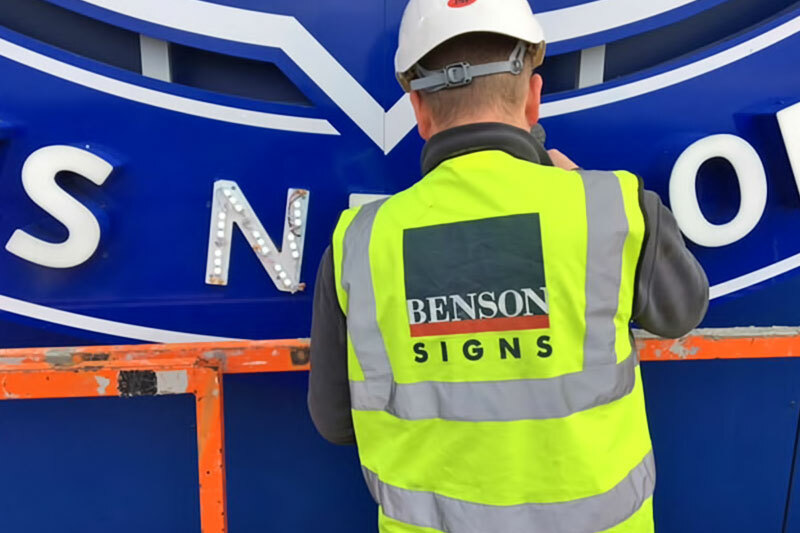 These crests were amongst the largest of these type of signs that we have manufactured and installed, we were pleased with the result and the part that they play in the impressive new look for the stadium. 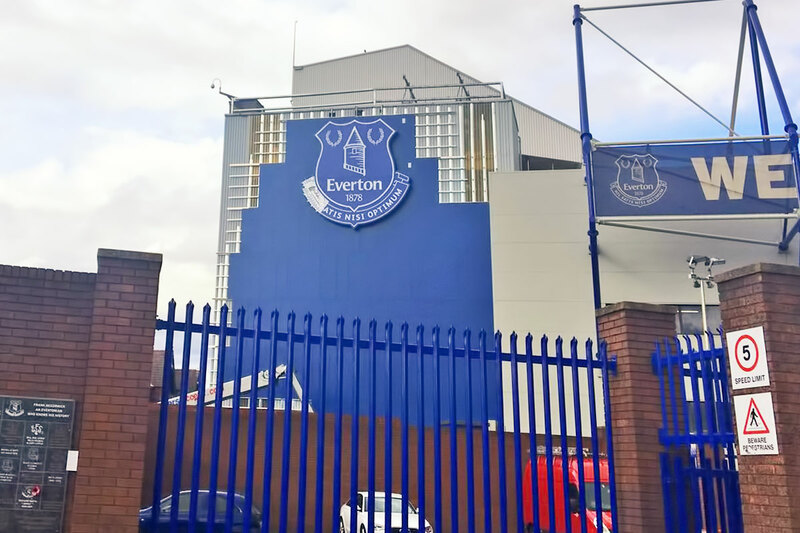 During the 2014 closed season we were asked by Everton Football Club to renew various signage around Goodison, as we have on many occasions over the last 25 years. 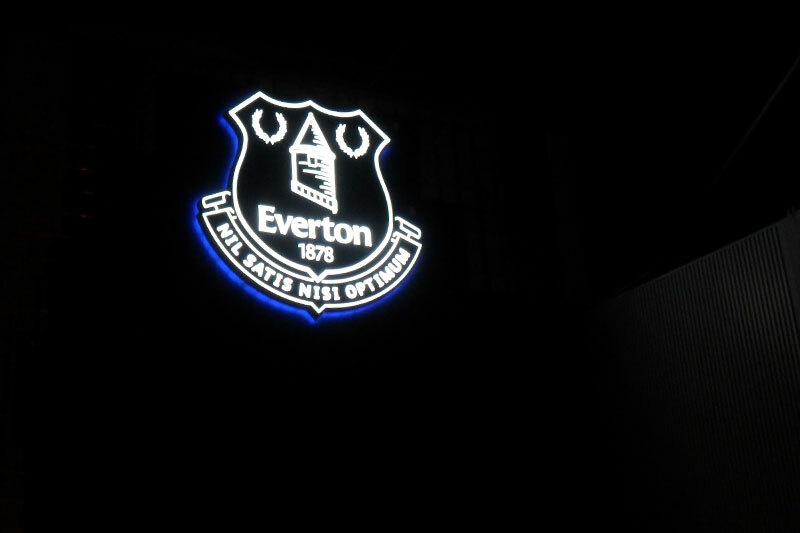 One of the reasons for updated signage was the introduction of a new EFC crest design. 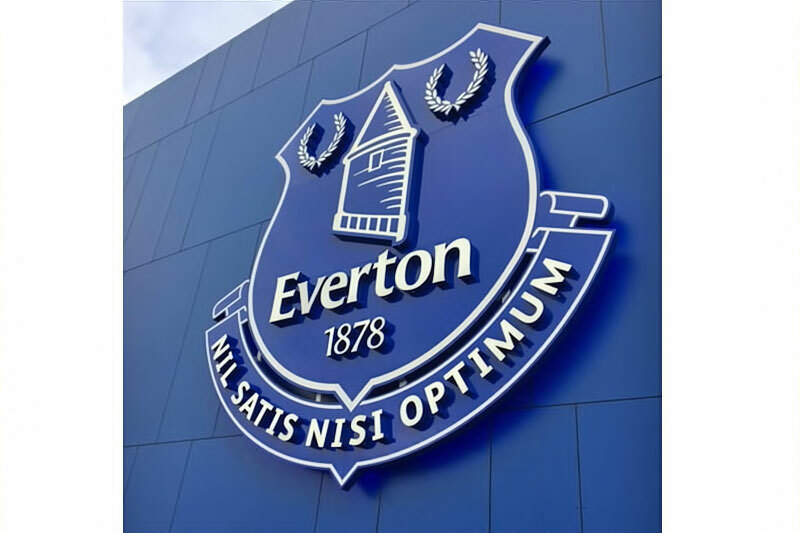 Because of the new crest design EFC decided that the large crests on Goodison Road and the gable of the Bullens Road stand should be replaced. This required the submission of several design & construction options. Upon approval of the design and construction method we were able to manufacture and install the crests, well within the closed season period. 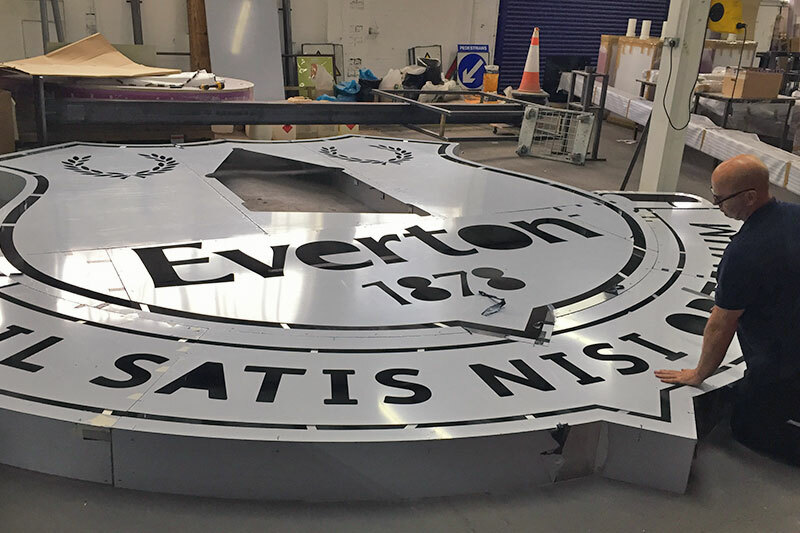 The replacement crest on Goodison Road is 4.5m x 4.5m overall and construction is built up powder coated aluminium with illumination coming from internal LEDs. 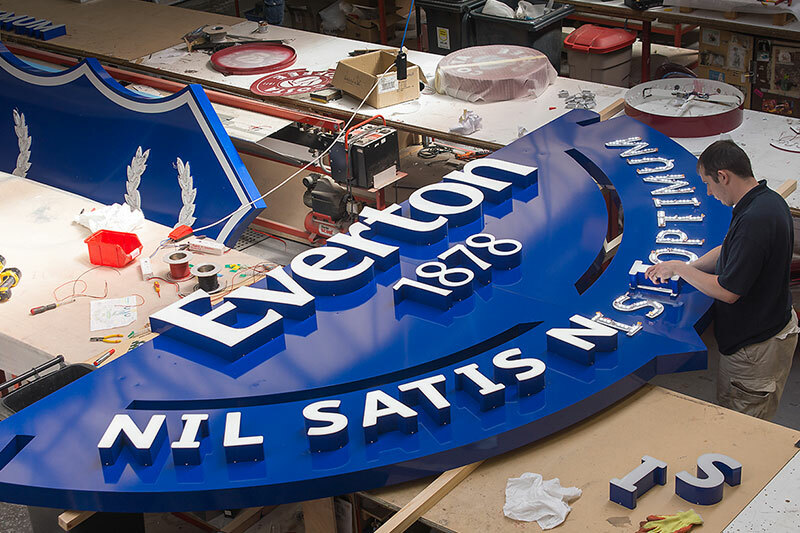 Also replaced was the non illuminated crest on the gable end of the Bullens Road stand. 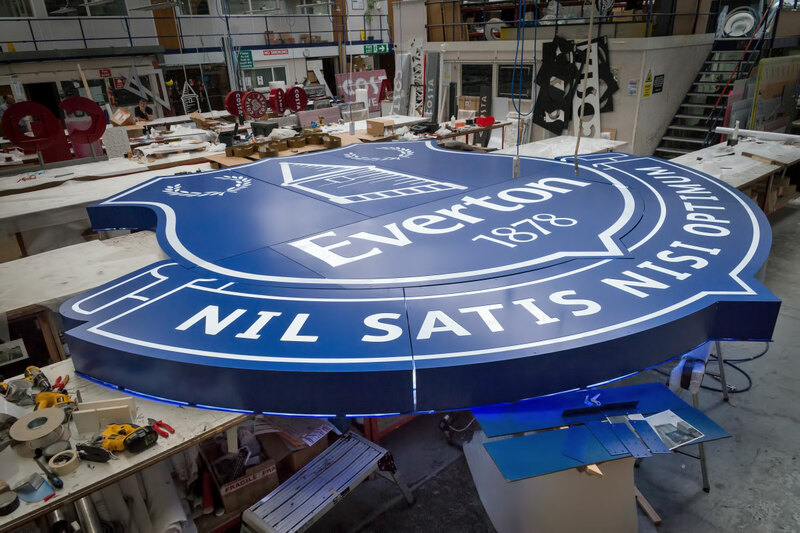 This is 3m x 3m overall and constructed in the same way as the Goodison Road crest, minus the illumination. New substantial steel support frames were also constructed & fitted to take both of the replacement crests. REGISTERED OFFICE CHRIS BENSON SIGNS LIMITED.